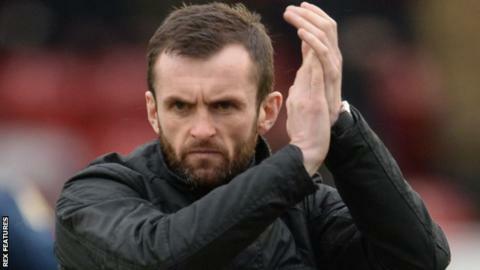 Luton Town manager Nathan Jones says fans should be proud of the team after going on a three-game winning run. Following Tuesday's 1-0 win over Morecambe, Jones gestured to the fans to try to gee them up. "I just want to get the crowd going, I want them to be proud of our team," Jones told BBC Three Counties Radio. "Not every game is going to be three or four-nil. There's no given right to do that, Manchester United, Chelsea or Manchester City don't do it." He continued: "You've got to work hard, you've got to have performances. "I felt we had a performance the crowd should have been proud of and to get behind. At the end of the day, we won the game." Jack Marriott's goal secured Luton - in their second season following promotion out of non-league - victory over the Lancashire club at Kenilworth Road. Jones replaced John Still on 6 January following a run of one win from their last nine games and the Hatters are currently 13th in League Two, six points off the play-off places. "I don't know, maybe we're way worse than before I came here. But I'm proud of them, they gave me everything and we had a way about us to play," said Jones. "Yes, things will break down sometimes in the final third, but they kept going and showed the character and commitment they have in recent games, and just got nine points out of nine. "I don't think it can get any better. Yes, we could win 10-0 but we aren't going to win 10-0. Not many sides are. "I'm super happy and the fans should be happy for this football club because we're moving in the right direction."